A friend (who also happens to be a colleague) and I went for an impromptu lunch at Kanpai and it turned out to be a serene location for a lunchtime treat. Decorated in muted hues and delicate features, Kanpai has a hint of both modern and traditional. There were plenty of different options on the menu without being over-faced with choice. In the end, I chose the tuna maki and the assorted sashimi salad. My dining companion opted for the crowned tuna tartare and the king prawn tempura. The dishes come out when they are ready and the first two dishes to arrive where the crowned tuna tartare and the tuna maki. There was a delightful little pot on the table to pour your soy sauce from. It’s little touches like these that indicated there was a high level of attention to detail. After the soy was poured, I got stuck into my tuna maki. I had to do all I could to refrain myself from devouring the whole lot in quick succession. This maki was seriously good. You could tell that the fish was of good quality and the sushi rice was simply perfect. I tried to let each flavour melt on my tongue before swallowing the food. I was a very happy bunny. On the other side of the table, my friend was making equally delighted noises over her crowned tuna tartare. This was a beautifully presented dish. The tuna was topped with breadcrumbs, to provide some extra texture, and the whole thing sat on top of a bed of rice. Thumbs up all round. As we were tucking into those dishes, the tempura and the assorted sashimi salad arrived. The salad was vibrant with pieces of avocado scattered across the top, along with a single prawn. The main ingredients of the salad were salmon, tuna and squid. Daikon, cucumber and spring onions could be found at the bottom. It also came with its own dressing which you could pour over to meet your own preferences. This was fresh and dazzling. It seemed to last for ages too, which felt like a bonus. I can’t recommend this enough. The tempura was also good, being light and flavoursome. It was served in a lovely basket. However, my friend commented that she would have liked some chilli in her tempura. That being said, it was clear that fish was where the speciality lies in Kanpai. 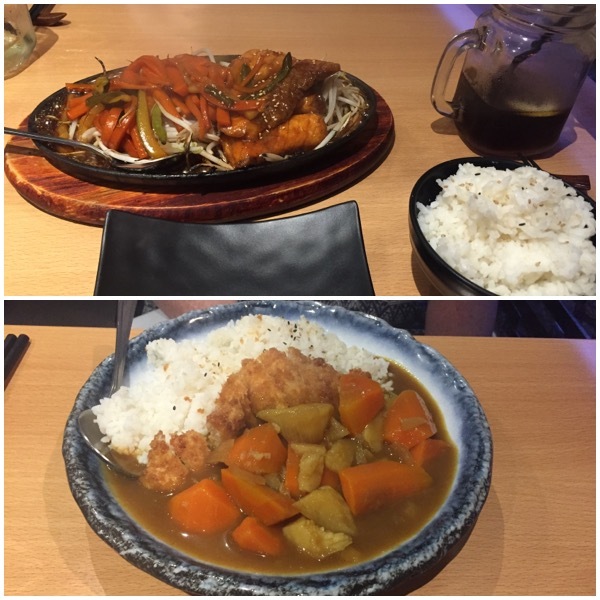 We both really enjoyed our time at Kanpai and can’t wait to go back again. The only downside, as is always the way with sushi, it’s not a particularly cheap option. However, Kanpai offers the quality which makes the price tag seem deserved. Would I eat here again? Regularly! 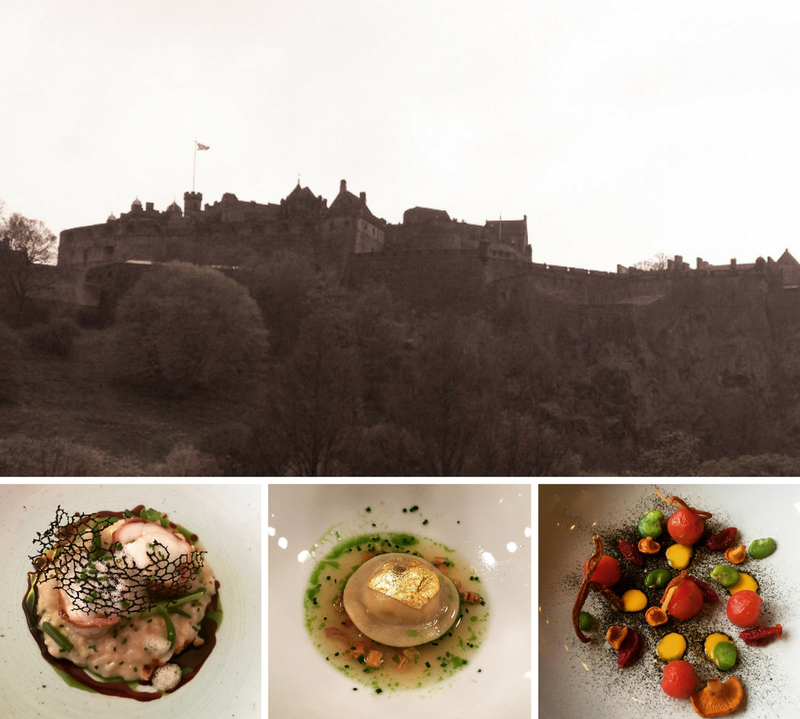 Tang’s can be found on Candlemaker Row, in the shadow of Greyfriars Bobby. A friend suggested meeting here for an impromptu lunch. I arrived first but stood waiting for a member of staff for getting on for 5 minutes. As it transpired, there seemed to be only one member of waiting staff and she had been serving some other customers on the upper floor (and was rushed off her feet the entire time we were there). My friend arrived just in time and we were seated on the ground floor. We had a look at the menus and both decided to order from the lunchtime menu. 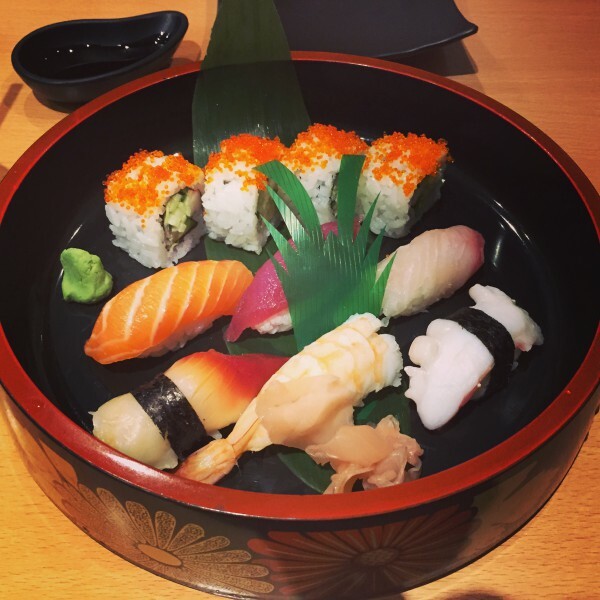 I went for the salmon set – a salmon sushi platter. My dining companion chose the chicken katsu curry. Whilst our server had been very busy, we didn’t have to wait too long for our food to arrive. My sushi was on a nice wooden serving stand. It looked very pretty, comprising of sashimi, nigiri and maki, with a small pile of ginger, wasabi, and a token bit of salad with a couple of slices of radish. I went for maki first and was surprised to find it was warm. The rice obviously hadn’t been cooled enough before rolling. This didn’t make it unpleasant though and worked quite well dipped into the soy. The nigiri was the same, with slightly warm rice, although as it was more exposed it was a bit cooler. The sashimi however was ice cold in one place on each slice, almost as if it had been frozen and hadn’t fully defrosted, which was a shame as it really did take any flavour out of the salmon. On the other side of the table, the katsu curry was a large portion. Which made it decent value for money. However, my friend felt the dish was OK but nothing more, and had experienced better elsewhere. We also found whilst we were eating that across from us, some tradesmen were working on fixing something, causing an awful noise as we finished our food. Whilst I know broken items need fixing, perhaps avoiding the lunch rush would have been better. All in all, a bit of a disappointing visit. We randomly chose to go to the Broughton Street branch of Bonsai on the spur of the moment as my friend had just got off the train from Manchester and this place is just round the corner from where I live. I had heard mixed things about Bonsai but we decided to give it a shot. The restaurant was decorated in relatively traditional colours of black, red and white. We were given a table at the window and provided menus. There was lots of choice on the menu, including beef tataki, which is often missed off Japanese menus but I really enjoy. 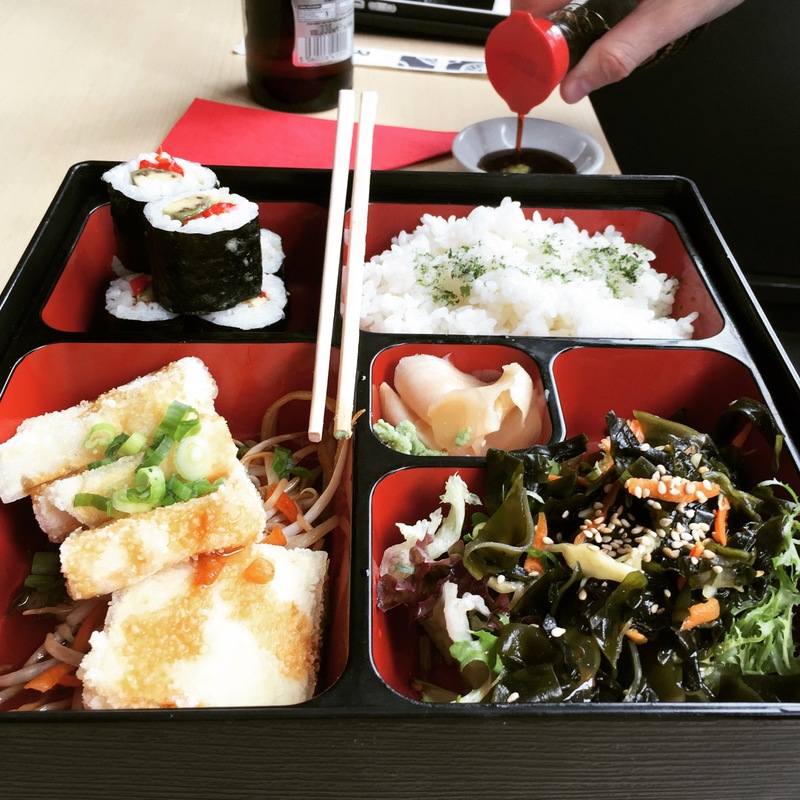 Saying that, we saw a deal for the bento box for £9.90 which seemed good value so we opted for that. You picked a main dish, a sushi dish and rice or noodles. I went for salmon teriyaki and tuna nigiri and rice in mine. My friend went for tofu and avocado and red pepper maki and rice. Miso soup was presented with the bento box. I often dislike miso as it can be a bit too salty for my palate but this was absolutely lovely. The spring onions gave it a nice lift. Unusually, I finished off the lot. 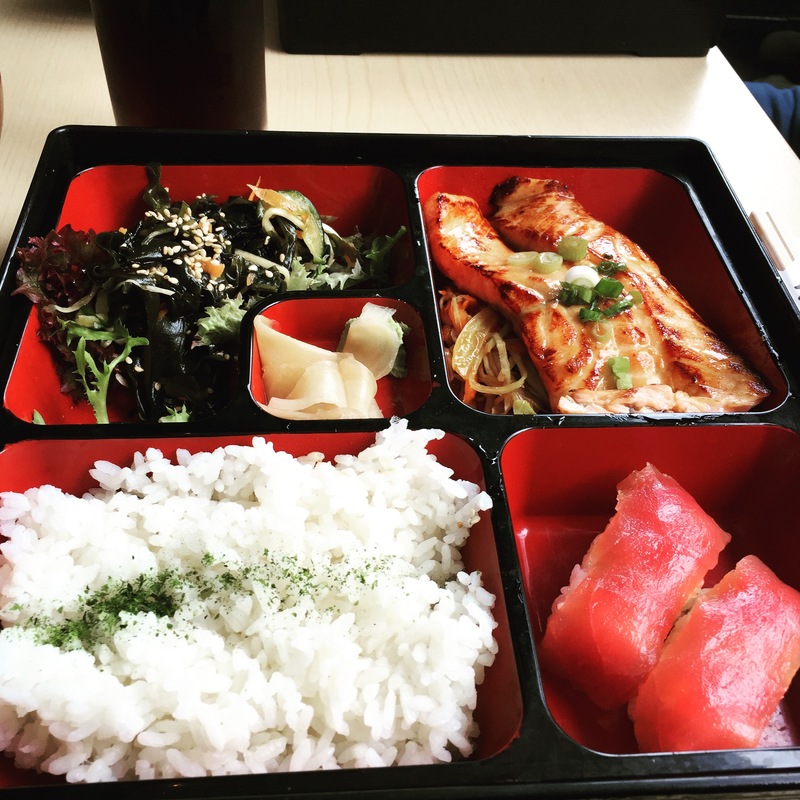 Onto the bento box itself, the teriyaki salmon was lovely and sticky. This was a generous portion of salmon. The tuna in the nigiri was good and rice held well for soy sauce dunking. I could have eaten many more of those (yeah I know – greedy). The rice was as expected and nothing really to report. The accompanying salad was a bit underwhelming and felt a bit limp. My friend had the same opinion of the salad. He enjoyed his tofu and maki rolls and thought they were decent. I would come here again for a quick lunch or dinner. Whilst the food did not blow me away, it was solid and did the job. Cost £25 for two bento boxes, a beer and a diet coke. I had been hearing good things about Bento Ya and when a friend suggested going after giving blood, I jumped at the chance. Easily accessed from Lothian Road, Bento Ya is a small restaurant with a lighter front section and a darker back section with twinkly coloured lights in the ceiling. We were seated quickly and started to scan the menu. There was certainly plenty that was catching my eye, so much so it was making it difficult to choose. In the end we went for a sushi platter to share as a starter and then I went for sizzling teriyaki salmon, which automatically came with rice and my friend went for chicken katsu curry rice. We weren’t able to drink but it is worth noting that the restaurant has a free BYOB policy for one bottle of wine between two people. We stuck to soft drinks, which were served in jam jars with handles, which didn’t quite fit with the rest of the restaurant. Without having to explain, it was understood that we would be sharing the sushi platter as a starter and were brought a plate and a soy sauce bowl each. The platter was beautifully presented in a lovely high sided serving plate. It had a mix of rolls and nigiri and a small pile of wasabi and pickled ginger. Each piece was absolutely delicious and would be extremely good value to eat for one person as a light main. The pieces didn’t collapse on picking up or eating, as often happens in Yo Sushi, which made them so much easier to eat and enjoy. After a little wait our mains arrived. Mine came sizzling in its dish as promised. A little side bowl of rice was also provided. The salmon was plentiful although felt a little chucked onto the plate. It was accompanied with beansprouts, carrots and beans. The salmon was soft and not dry. Sadly though the teriyaki flavour was a bit lacking for me. It hadn’t permeated the salmon much and seemed a bit watery across the dish. The vegetables were nice though and the rice was well cooked. On the other side of the table, the katsu curry rice came in a humungous bowl. My friend was a bit over-faced with it. The carrots that accompanied the dish were simply too big to eat, particularly with chopsticks. Again the meat was fine but the sauce lacked flavour and was a little too thin. There was far too much rice and she couldn’t finish her portion. Whilst the restaurant had got busier since we arrived, it took over 20 minutes for us to be able to ask for the bill and even then we had to get someone’s attention and the table wasn’t cleared. So overall, I think if I headed back to Bento Ya it would only be for the sushi and I’d only go if I was not in a hurry.